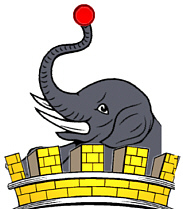 Coat of Arms: Silver with a chevron between three black elephant heads, and on a red chief two plates and a broken sword. Crest: Out of a mural crown, an elephant's head charged with a torteau. Torteau. (plural Torteaux) a red roundle, termed in French cerises, cherries. By some termed Wastell-cake. Motto Translated: Conscious of no Wrong. Spelling variations include: Saunders, Sanders, Sawnders, Sainders, Saynders, Saunderrs, Sannders, Sanderrs, Saunder and many more. First found in county Wicklow where they were granted lands by Strongbow, Earl of Pembroke, for their assistance in the invasion of Ireland in 1172. Some of the first settlers of this name or some of its variants were: Alexander Sanders who settled in Virginia in 1623; along with David, George, Henry, Richard; William Sanders settled in the Barbados in 1680 with his servants. 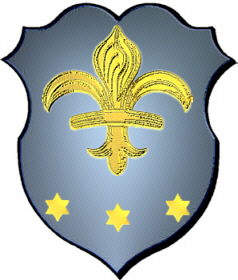 Coat of Arms: Silver with a gold fleur-de-lis. There are three gold estoiles under the fleur-de-lis. Spelling variations include: Sander, Sannder, Sandder, Sanders, Sanderes, Sandre, Sandders, Sannders and many more. Some of the first settlers of this name or some of its variants were: Jehan Sandre, who arrived in Acadia in 1636; Tho Sannders, who came to Virginia in 1673; Richard Sandders, who arrived in Virginia in 1694; Abraham Sanders, who arrived in America in 1771. There are several theories about the origins of the Sanders/Saunders name. 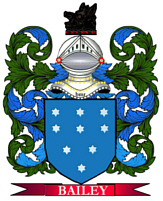 We believe our Sanders/Saunders family originated in Scotland. Many of the early Sanders then migrated to England and Ireland and eventually to America. It is believed that their reasons for leaving the Isles were both political and religious. History records show that Mary Queen of England (aka “Bloody Mary”) from 1553-1558, burned nearly 300 protestants at the stake. Victims included blind men, pregnant women, and Church leaders. The root origins of the name came from Alexander meaning “helper of mankind”. In early European history some settlers had named their first male child after Alexander The Great, and that it was shortened to names such as Alisandre (French) and Zander (German) and then anglicized to Sanders/Saunders by the early settlers in Scotland and England. Scottish history indicates that Sanders/Saunders were septs of the MacDonald or MacAlister clans1. A good source of information about Scottish clans and septs can be found at: www.yourscottishname.com (heavy graphics, slow loading). Today there are about 360,000 individuals in the US with the name Sanders or Saunders and it ranks 71st as the most frequent surname (Smith being #1). Spelling variations include: Sanders, Zanders, Centers, Senders, Sander, Zander, Sender, Center, Senters and many more. First found in the region of the Rhineland, where it is believed to have first emerged. Some of the first settlers of this name or some of its variants were: Gabriel Senter, who came to Germantown, Pennsylvania in 1709; Catharina Sanders, who settled in Pennsylvania in 1796; Albert Sanders, who sailed from Bremen to New York in 1866. 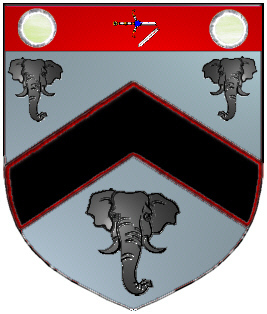 Coat of Arms: A black shield with silver chief containing a label surrounded by two red bull's heads. In base, two chevrons, below these a silver bull's head. Label. A name given to the ribbons that hang down from a mitre or coronet; the scroll on which the motto is placed is also termed a Label, Scroll, or Slip. 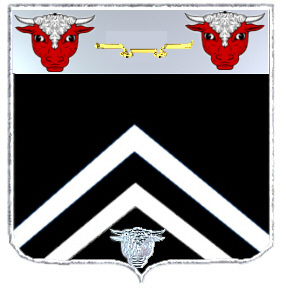 Crest: un boeuf iss. de gules, la tête posée de face, le corps ch. de trois étoiles d'argent, surmontées d'un lambel de sable; tenant entre ses pattes une rose d'argent.